I’m sure 98% of the people who loves to travel knows booking.com. I’ve used this site all the time to book hostels (or hotels) when I was in Bali and Australia. It’s a really easy to use this site and it’s easy to pay. I’ve used this site so much that I have now a genius account, which means you get discounts on some accommodations. In this article I will tell you how to use this site and give you some tips to save money. Like I said above booking.com is a site where you can book your stay during your trip. You can book for one night, but if you want to stay longer that’s also possible. Booking.com has accommodations all over the world, so you can use this site wherever you go. I really want to go to London, so that’s the city I’m going to look for. The first thing I’m going to do is fill in the destination and the check-in and check-out dates. I use Februari 4 as check-in date and Februari 9 as check-out date. Because I’m going by myself, you have to fill in there’s only one guest. And.. Search! Tip: You can also search when you don’t have specific dates yet and compare which days are the cheapest. 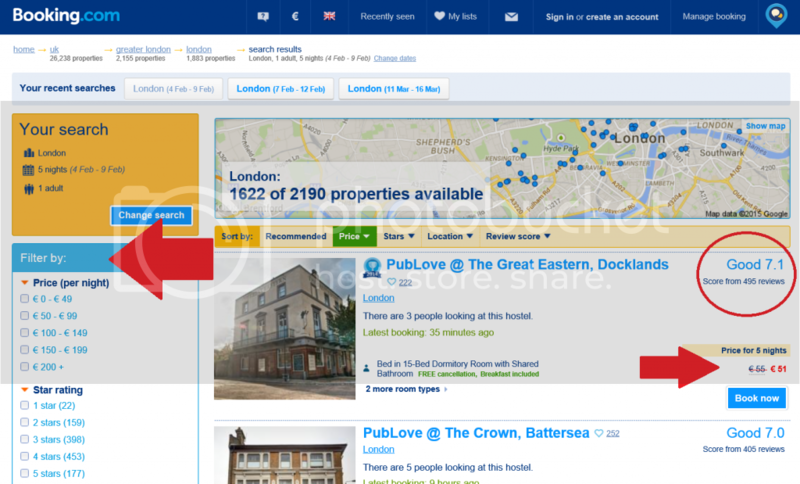 When you click on search you come to the page with the highlights of London when you talk about accommodation. Those hostels/hotels are recommended by booking.com, but most of the times they are really expensive and for me it’s important to stay on budget. That’s why I click on sort by price. You have four options; 1 person (including dormitory beds), 1 person (single rooms), 2 persons (double and twin rooms) and 3 people (triple room). The most cheapest option is most of the times to stay in a hostel/dormitory (option 1). When I’m alone most of the times I stay at a hostel, but when I’m with my boyfriend I take a double room. For this stay I choose the first option, because I’m alone and London is a really expensive city, so I can save money for other things to do. When you click on the first option, the first hostels you see are the cheapest. When you go further, they are becoming more expensive. One thing I really like about this site is the fact they have tons of reviews of the accommodations, so it’s really easy to see if it’s worth the money. For me (most of the times) above a 6.5 is enough. Of course this is also personal, but I don’t mind about luxery. I want it clean and I want to sleep, so no party hostels for me. If you want a hostel with a review score higher than e.g. 8, it’s possible to filter your search on it. There are different kind of preferences you can filter your search on. For example for wifi, meals served and location. You can filter your search to your own preferences and find the perfect hostel/hotel for you. A lot of hostels serve breakfast within the price of your stay. To save money, most of the times I look for hostels with breakfast included. Of course I don’t to pay a lot of money for it, so I compare it with the hostels which doesn’t includes breakfast. If it’s cheaper than a sandwich at a café (and the reviewscore is high enough), then I will take that hostel. Don’t expect too much of the breakfast, but hey it’s for ‘free’. If you found an accommodation, the best thing to do is make an account (or login). When you book with your account, you only have to fill in your personal information onces. When you book more often with your account, you’ll get discounts on some hotels/hostels. The last thing you have to do before you book is delete your cookies and start all over your search. Because when you are searching for an accommodation in a specific place, your internet will remember this. Just as your flight tickets, your citytrip tips and all the other things you searched for. 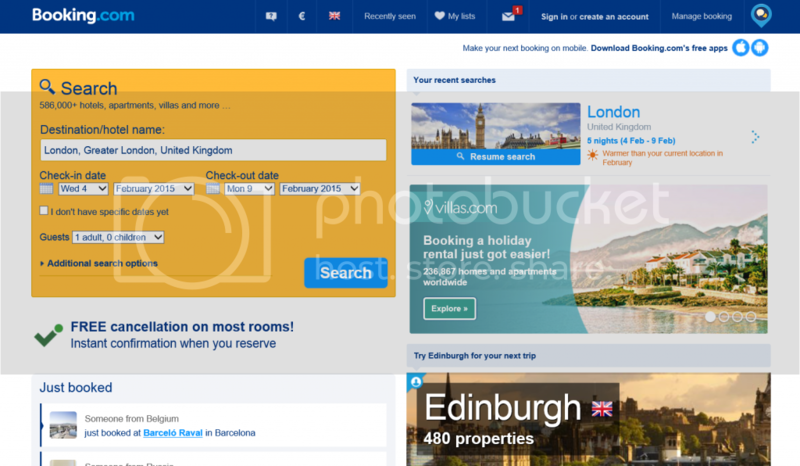 Booking.com knows you need an accommodation in that city and raise their prices. So when you delete your cookies, it’s very common you save money. Do this trick also with flight tickets. Believe me, it can save a lot of money. 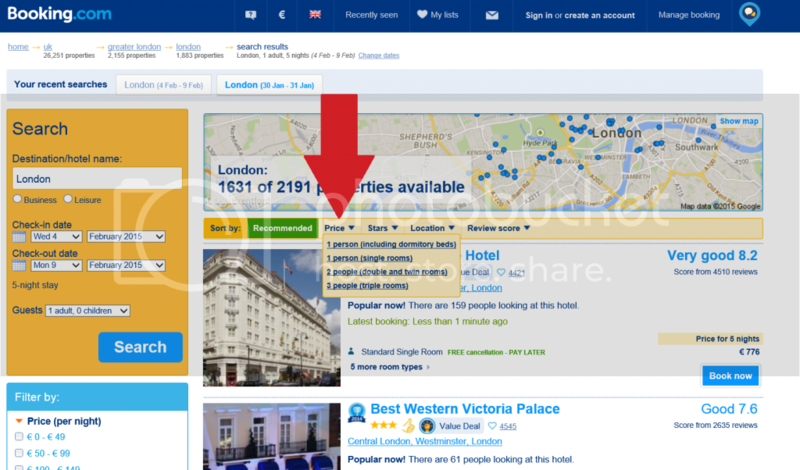 Tip: When you go booking.com and you are sure that you book a room immediately (so you don’t search a lot), you can delete your cookies before you go on the site. That’s also the reason why I don’t have a screenshot of the difference in price, but before I deleted my cookies I had to pay €72,- and now €51,-. So it’s really worth the try! Did you ever used this site for booking an accommodation?